As a self-confessed packrat, I'm very impressed with how modern, minimalist homes always seem so organized. Where do the residents put their stuff? When I look around me, every surface is piled with books, papers, fabric samples and the detritus of my life. While my personal style is not modern or clearly minimalist, I do look jealously at how my mod friends do it. Of course, they're very good at putting things away immediately or getting rid of anything not needed. And it must certainly help to have storage options that fit the lifestyle of the homeowner as well as the space itself. Here is a great collection of modern, modular wall storage products that are all high style, as well as problem solvers. Cheeky Boxes from Process: Cheeky Boxes is a fun name for a fun yet deceptively simple modular wall storage system. Cheeky boxes are a single simple geometric box shape that can be used in a multitude of positions to create a totally customizable wall storage unit that fits your space and individual needs. 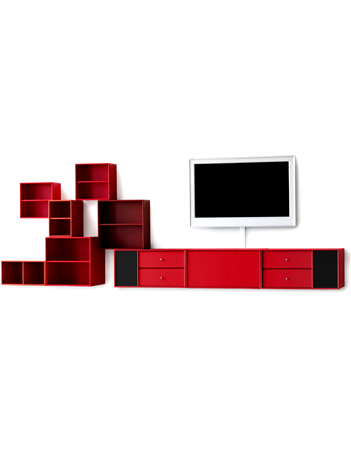 Vita Wall Unit Storage by MDF Italia: The Vita Wall Unit is a modular system with shelves and cabinets. It is easily adjustable and changeable as needed. The name “Vita” references the Italian for “Game of Life” which is befitting this totally customizable product that will literally fit into any modern living space. 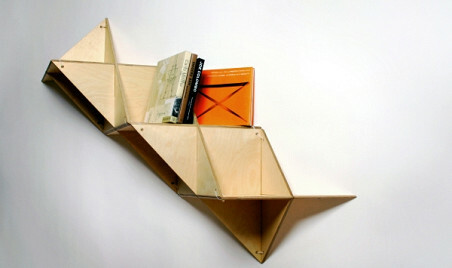 T.Shelf by J1 Studio: This modular storage system is made up of very strong plywood triangular boxes that can be assembled into many different shapes and configurations including wall units or free standing shelves. The boxes are fastened together using zip ties, which makes assembly quick and easy. 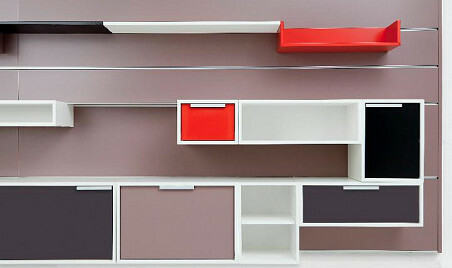 Wall Storage System by Muunto: The Muunto Wall Storage system is a complete system for any room in a modern home. It consists of horizontal MDF wall panels with aluminum grooves into which an assortment of open shelves and/or closed boxes with pullout drawers can be fitted for a perfectly customized solution. The system comes in a variety of colors -- from black, for a sleek contemporary space, to pastels, for a mod and organized kids space. Modular Wall Storage from Pottery Barn: The Modular Wall Storage system allows for personalization of bathroom storage. 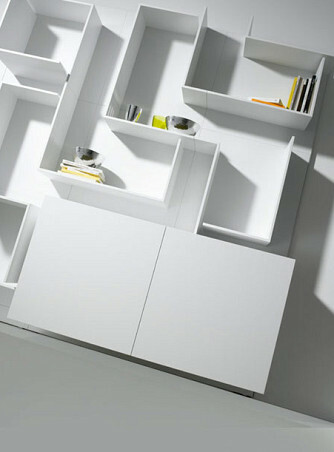 Three optional pieces are available: an open box with shelves, glass shelving with hooks and a closed cabinet. Pieces can be mixed and matched. Go with the simple open box style and glass shelves for a more modern look. Montana Living by Montana Mobler: These simple square boxes of the Montana Living system come in 42 basic units with 4 different depths and in 49 colors. The system includes sides, shelves, partitions, drawers, trays doors, lights, locks, casters and handles, resulting in a nearly unlimited amount of variation for total design control and customization. 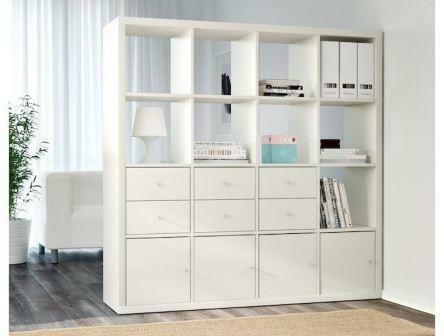 Kallax Series from Ikea: The Kallax series offers a wide array of wall storage boxes that can be standalone or wall mounted. Included in the series are inserts with doors or drawers for closed storage, a television storage unit and attachable workstation. The storage cases come in varying sizes from large multi-box units to small four-box units, allowing for great mix-and-match capabilities. Would you like to design your own personalized modular storage system? Find a carpenter to bring your ideas to life. Linda Merrill writes for Networx.com.